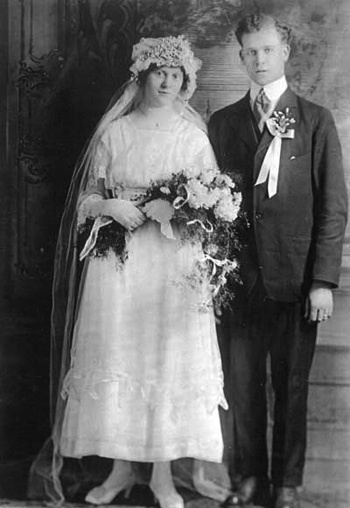 Henry Glanz (son of Jacob Glanz and Dorothy Reitz) and Marie Henkel (daughter of John Henkel and Alice Block) were married on March 18, 1918 at St. Paul's Evangelical and Reformed Church. Henry is wearing a traditional white wedding ribbon. Photograph courtesy of Nancy Cooper, Kathy Hoffee and John Killian. Photograph and information courtesy of Nancy Cooper, Kathy Hoffee and John Killian.